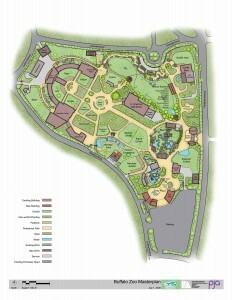 Over the past few months a number of news reports have hit the media announcing the unveiling of new zoo master plans. 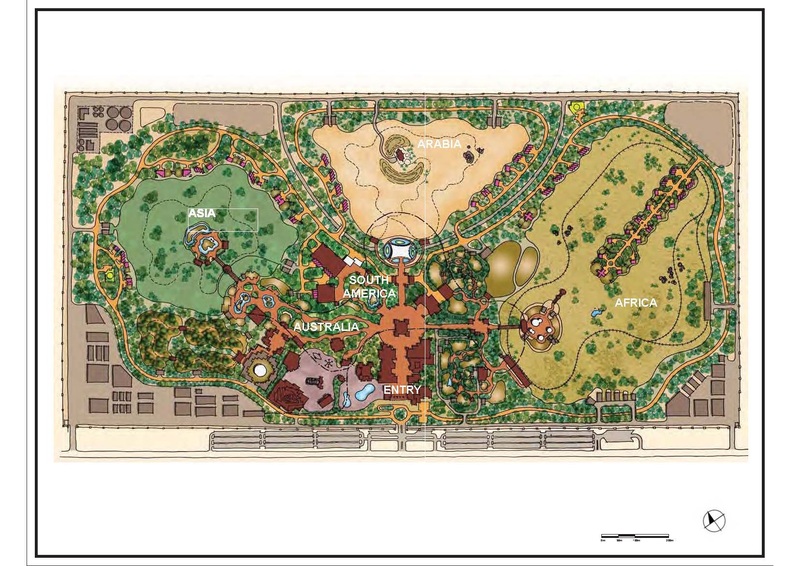 As a zoo designer, I am always interested in all of these new plans and how the chosen design firm physically laid out the new design and if it does or doesn’t make sense too me. 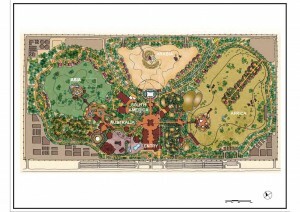 After all, master planning is the backbone of zoo design. A few of the things I look for are very straightforward. What is the over-laying theme of the new plan? Is the organization of zones zoogeographic, taxonomic, bioclimatic, biogeographic or something else? Does it have a clear hierarchy of pedestrian circulation for ease of visitation? If it is a master plan for a brand new zoo does it incorporate a hub and spoke system? Maybe a daisy chain system was employed instead. On an existing zoo maybe neither of these types of layouts could be used as it would have meant a total overhaul of the zoo and have been economically impossible. These are the questions that can be answered easily just by looking at the physical document. The real question that we at PJA always contend with is what is the appropriate length of time for the phasing of a master plan? You see, and we have participated in, all different timeframes for the physical build-out of a master plan. Plans that look at renovations of a zoo in 5 years, 10 years and up to 20 years are all part of the norm. Does the number of years really matter when it comes to planning? This is where I am asking you, the reader, for your opinion as to what you think is an appropriate time frame to design for. As I stated, we have completed all types of master plans with all types of schedules for completing the plans. Why the difference and which time frame is best for zoos in our rapidly changing social landscape? While the twenty-year master plan lays the way for a steady, even growth of a zoo, does it really meet the needs of the zoo with regards to our ever-changing society? Is a five-year master plan too shortsighted? One project can take this long and even longer, much less a build out of part of a zoo. One thing we know at PJA is that any master plan needs to be a flexible, working document, flexible because you never know what is going to happen in the zoo industry. Zoo directors come and go, with the new one always wanting to put their stamp on their new domain. Fundraising goals are or aren’t met depending on a number of variables, from economic downturns to bad development staffing. Then there is always the one big donor who promises a large amount of money if you are willing to put in an exhibit of his or her favorite animal, even if it doesn’t fit into your collection plan or the master plan. I think the biggest new factor effecting the planning of future zoos or the redevelopment of existing zoos is the need of people to have something new all the time. Everything is changing so quickly in our society that something five years old is really old! According to Social Times, the average usage of a cell phone in the U.S. is 18 months before people get the new, faster, better-hyped version. How does a zoo stay current for people if they are following a plan that was developed in 2000? So back to my main question, what is the appropriate number of years for a master plan? Is it a 20-year master plan? A 10-year master plan? 5 years? We would love to hear from you about what you think makes the most sense, and why.